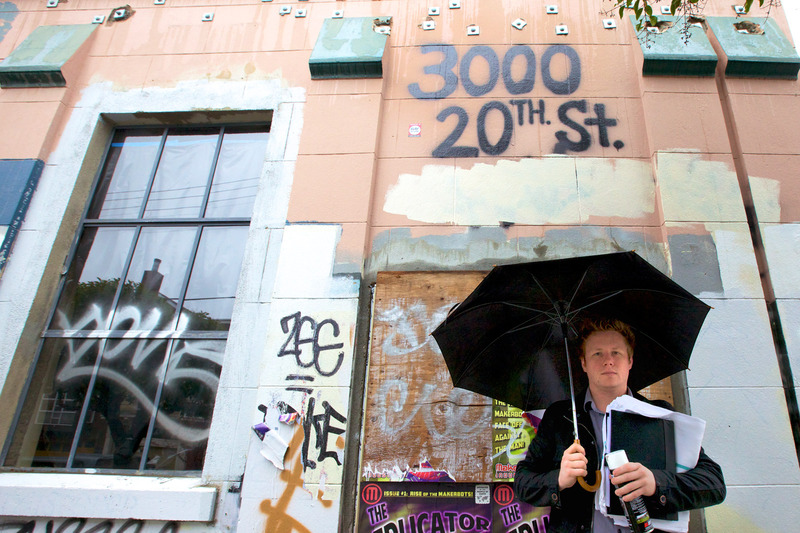 Chef-owner, Thomas McNaughton, stands in front of what will soon be Salumeria, part of the 3000 20th street development. Some of the hottest food names around are betting big on turning the north side of 20th Street between Alabama and Florida streets into, well, a food court of sorts. In all, the four new restaurants — Flour + Water’s Central Kitchen and deli Salumeria; Humphry Slocombe’s Parlour, a bakery and café; and Trick Dog, a bar that serves food — are sure to change what is now a quiet corner in the Mission District. A green moat, known as a biophilic streetscape because of its permeable pavement and native plantings, will surround the project and the current tenant of 3000 20th Street, the visual arts nonprofit Southern Exposure. That community began to develop in 2009, when Vera Cort, a local landowner, leased space to Southern Exposure on the northwest corner of the development project. Located in the southeast Mission, where light manufacturing once thrived, the building had been vacant since the 1980s. In the first half of the 20th century it housed a sausage factory. Later it was briefly home to a communist bakery called the People’s Food Movement. The first of the five new tenants slated to join Southern Exposure sometime in the next month will be Central Kitchen and Salumeria, projects of the Ne Timeas Restaurant Group owned by David Steele, David White and chef Thomas McNaughton. The trio is known for the hugely successful Flour + Water, which opened in May 2009 just two blocks away. Southern Exposure has been in the Mission for 40 years, and the other tenants have Mission roots too, though not as deep. After only three years, both Flour + Water and Humphry Slocombe consider themselves Missionites. Trick Dog is a new name, but one of its creators is Mission resident Josh Harris. Even the green moat has Mission cred: it’s being designed and spearheaded by long-time Mission dweller and worker Jane Martin of Shift Design Studio and Plant SF. “It is a very special and unique neighborhood, and it is on the cusp of a golden era,” White said. While Flour + Water has had great success, executive chef McNaughton, a James Beard Rising Star Chef, has felt limited by the menu’s focus on pasta and pizza. “Tom is a very talented guy. We want to push it a bit and elevate it,” White said, adding that McNaughton believes everything should be made from scratch. And space it will have. Central Kitchen’s workspace takes up 60 percent of the restaurant’s 1,890-square-foot floor, compared to 15 to 20 percent for most restaurant kitchens. Diners will only be 10 feet away from the person making their meal. The current facade of what will soon be Central Kitchen. Half of the restaurant’s 49 seats will be located in the courtyard, so the owners have tried to make it as weatherproof as possible. Even on a stormy evening, they want diners to be comfortable. Also on track to open within the month is Salumeria, the Flour + Water group’s other project at 3000 20th Street. It’s where a lot of those sliced-up pigs from Central Kitchen will be sold. “Salumeria is an old-world-inspired deli,” said Liz Subauste, formerly the general manager at Flour + Water and soon to be the assistant general manager at Central Kitchen. While the courtyard belongs to Central Kitchen for dinner service, during the day Salumeria will share the outdoor space. Customers can buy sandwiches to go or eat them in the courtyard. The deli will also sell house-cured meats, cheeses, homemade Flour + Water pasta, pasta sauces, wine and beer. “It will be as if you were walking into our larder: olive oils, vinegars, condiments, etc.” said Subauste. Salumeria is currently slated to be open daily from 10 a.m. to 8 p.m., but that may shift depending on the needs of the neighborhood. A view of the northeast corner of 20th and Florida streets. Salumeria will occupy the corner unit. 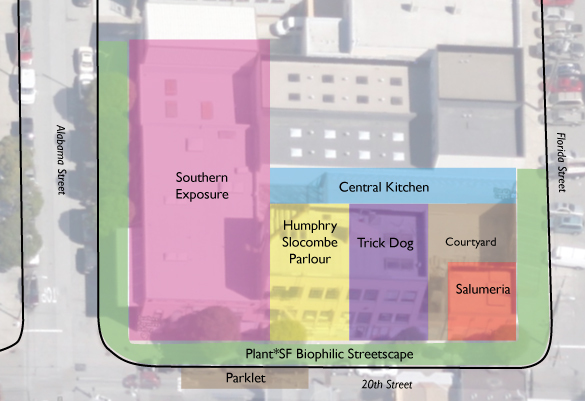 Trick Dog and Parlour will be in the taller units to the left. Also on the courtyard but without access to it will be Trick Dog, a bar that will also serve food. It is the creation of Scott Baird and Josh Harris, two bartenders collectively known as the Bon Vivants, also the name of their beverage consulting company, which does everything from guerilla marketing for the big brands to designing cocktail menus for local watering holes. 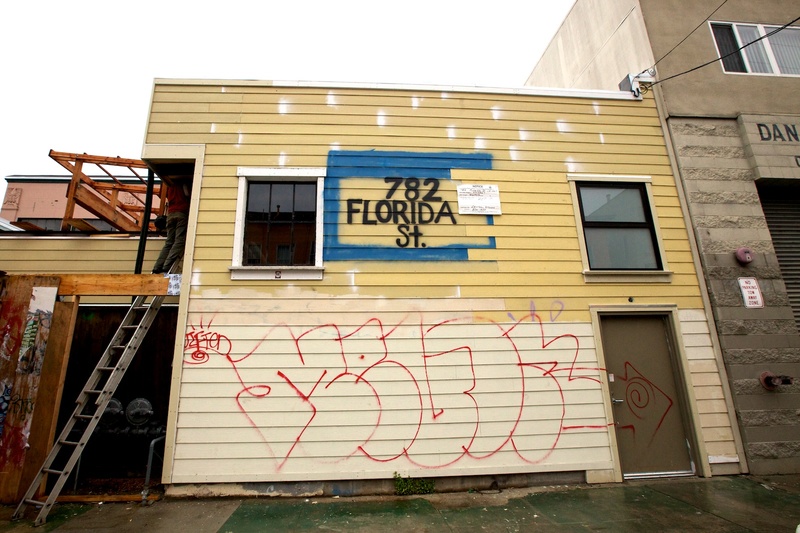 This will be Baird’s second bar; he also revamped 15 Romolo in North Beach. It will be Harris’ first. The third partner, Jason Henton, will serve as the operations and general manager. He is the one who “keeps me in line,” said Baird. Baird said that when the Ne Timeas Restaurant Group first signed the lease for 3000 20th Street, they wanted a bar from people who knew bars. They sent out a request for proposals and Trick Dog won the competition. When Trick Dog opens — “before Halloween” and “before the weather gets cold in 2012” was as precise as Baird was willing to get — it will be a place to get both high-quality food and fancy cocktails in a fun and accessible atmosphere. Baird described the food as a “gonzo menu,” meaning free, open, unedited and playful. The goal is to serve food from 5 p.m. until 1:30 a.m., to give people in the restaurant industry an alternative to pizza or a burrito when they get off work. While Baird will influence the menu, Chester Watson will be the chef. He has worked for Joël Robuchon and Thomas Keller, and most recently was executive sous-chef at Quince. “More Cheers, less Alinea,” he added, the latter a reference to Grant Achatz’ Chicago restaurant that offers molecular gastronomic cuisine on plates that more often resemble museum tableaux than food. The owners of Humphry Slocombe, Jake Godby and Sean Vahey, are much more tight-lipped about their new project, Parlour, which will open in the space between Southern Exposure and Trick Dog. Even the employees at their wildly popular ice cream shop on 24th and Harrison say they are being kept in the dark. Parlour is slated to be a bakery and café that serves beer, wine and coffee. Plans call for it to be open all day, from 7 a.m. to 11 p.m. If Godby’s pop-up at Truck Stop last month is any indication of what might be on the menu, Inside Scoop is probably not far off. With offerings like duck fat chex mix, grilled cheese with brisket and tomato jam, and bourbon and coke float with chocolate chip cookies, his reinterpretation of the classics is decidedly his own. And with Boccalone lard shortbread cookies as one of Humphry Slocombe’s celebrated recipes, we know another place those pigs may be going. go back to valencia street and leave the east side of the mission alone! 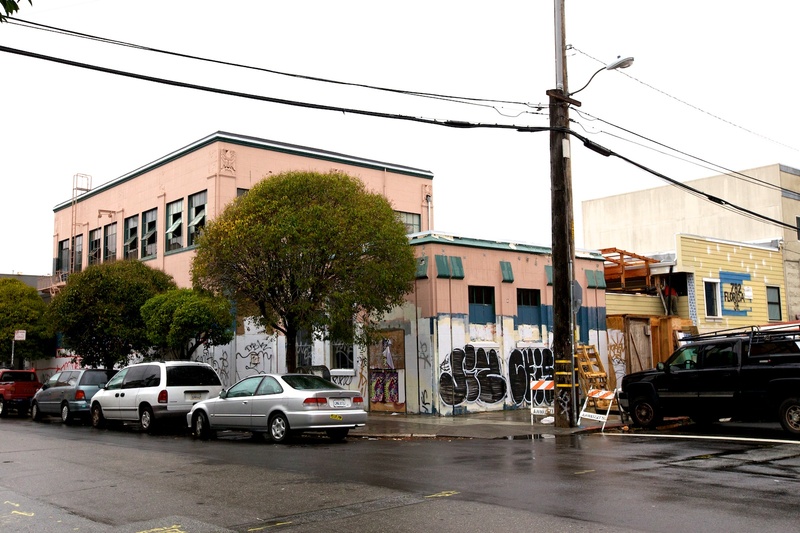 “We think it will become like 18th Street between Dolores and Valencia,” said David White, an owner of Flour + Water. “It is kind of a gourmet ghetto with a sense of community.”- SOUNDS HORRIBLE! Oh god, no. Stop the madness. i agree with maximillian, the mission is now a playground for hipsters with disposable income. all this blah, blah about community…what community is that? pretentious people connecting with other pretentious people? Sounds very creative and fun. Ignore the haters. How many cutesy bars, cafes, and restaurants does The Mission need? Can we possibly get a new family-style place? I realize most of the new residents in the East side of the Mission are post-industrial, tech-head, singles, who love fancy cured meats and $12 cocktails, but there are still enough blue-collar, long-term residents of the E.Mission to support businesses that cater to them. Perhaps you should start one. Well this Marina Girl is super excited! I cant wait to have a new area for me and my pals to come to on the weekends! New places to yelp about…I love it! Is there still going to be space to park my Land Rover? Is it too much to ask when this all will actually open? Thrive? As in getting rid of the brown people? I live over near here – honestly, it will be nice to have more people over here rather than the creepy lack of people late in the evening. Now, if the arts commission could ever decide what color the toilet paper should be for the park at 17th and Folsom, this part of the Mission would really possibly thrive. This sounds great! What would be nicer though would be more retail oriented places. There’s pretty much enough restaurants already. We’re spoiled with them. Most residents don’t eat out a lot because it’s way too expensive. It’s good to know one of these will be a salumeria, selling meats and cheeses and stuff. Looking forward also to the new grocery store on Harrison. Its to bad its not going to be for the locals. Give it time and the locals will revolt. 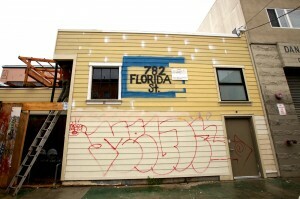 It happened in Noe Valley about 7 years ago and its starting on Polk. In Noe Valley it got so bad with traffic and tons of tourist and foodies that they placed a moratorium on restaurants. Every 5 years they see where they are to see if they should allow some more or not. The beauty of the North Mission is the mix use. It could loose that charm. We need to be care full and not go overboard. Valencia has become such a destination corridor that it lost its sense of community and culture and became very dry with no soul. The new folks that open business’s here are very money focused and want to make a killing on what is trendy and new and hot at the time. Give it time…. @Missionbred: The revolt in Noe ended and they are adding new restaurants there. The people realized that when you limit the supply of restaurants you end up with places that are both expensive and crappy. Not too suprising really but basic economics has never been a strong point of SF. Anyway, if people like these restaurants and it is a way for others to make a living, why are you complaining?